nextzett wheels gloss is a specialty Concentrate for easy maintenance of brake dust which soiled wheels and brakes on the basis of non-ionic surfactants and evaporation retarders. 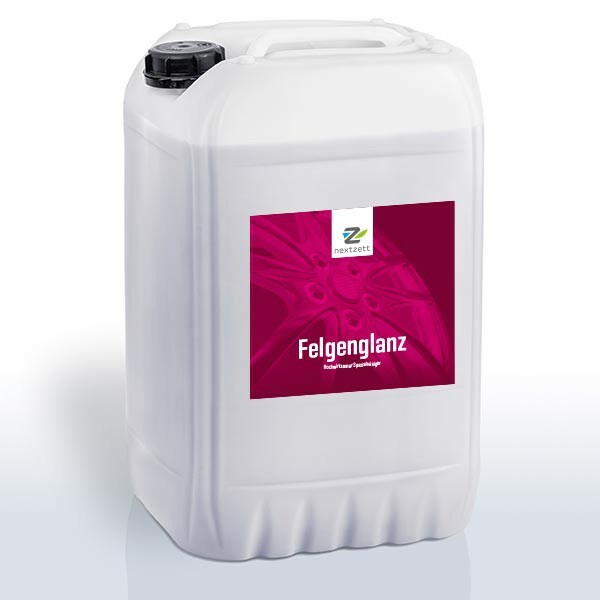 High-quality surfactants with a biodegradation wheel of over 95% form the basis for a material-friendly rim cleaning in the professional as well as the end customer area. Organic acids as well as anti-corrosive agents round off this well-balanced formulation and ensure easy and fast cleaning. nextzett rims shine is exclusively its use in the professional sector. In sprayers, spray bottles: Apply to the pre-wetted rim. Dilution 1: 5 with water. Maximum exposure time 1 min. Spray the elbow: Apply directly via a dosing pump to the spraying device. Apply the next step to the pre-wetted rim, do not allow it to dry. Then rinse the rim cleaner and dissolved dirt thoroughly with a strong water jet. Repeat stubborn stains with brush or sponge. After cleaning, a brake test is essential. Inadvertently sprayed parts wash with water. Anodized and non-painted light alloy rims can react with discoloration if used incorrectly. Rinse after use rimless with water, especially tire valves and brake discs. Braking required. In case of excessive use without sufficient flushing, valve leakage is possible. Our warranty is limited to the same quality. Use exclusively according to product description. Max. Application 2 x monthly.